Council housing is more important than ever, but faces major threats in 2013. Councils will decide whether to remove some Secure Tenancies and introduce up to 80% market rents. And rent rises plus benefit cuts threaten more poverty, debt, evictions and homelessness. Tenants are demanding genuine consultation on these and other changes to Landlord/Tenancy strategies, including access to the waiting list and housing for the homeless. Councils have already changed or postponed changes which undermine tenants’ rights, due to lobbying and campaigns. Rent rises and benefit cuts will hit council tenants in 2013. Many councils are proposing rent rises well over inflation. And Benefit changes from April 2013 will: * cut 14-25% off housing benefit for up to 600,000 tenants hit by the ‘bedroom tax’ * housing benefit will be cut for anyone over a new total benefit cap * Council Tax Benefit reductions mean millions will have to pay more And from October 2013 Universal Credit will cut benefit further for some, including disabled people, households with two earners, mothers and people paying for childcare. 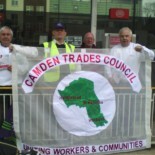 This entry was posted on January 7, 2013 by CAMDEN TRADES COUNCIL.